(Nanowerk News) Scientists searching for traces of drugs, bomb-making components and other chemicals often shine light on the materials they're analyzing. This approach is known as spectroscopy, and it involves studying how light interacts with trace amounts of matter. One of the more effective types of spectroscopy is infrared absorption spectroscopy, which scientists use to sleuth out performance-enhancing drugs in blood samples and tiny particles of explosives in the air. While infrared absorption spectroscopy has improved greatly in the last 100 years, researchers are still working to make the technology more sensitive, inexpensive and versatile. A new light-trapping sensor, developed by a University at Buffalo-led team of engineers and described in an Advanced Optical Materials study ("Efficient Mid-Infrared Light Confinement within Sub-5-nm Gaps for Extreme Field Enhancement"), makes progress in all three areas. "This new optical device has the potential to improve our abilities to detect all sorts of biological and chemical samples," says Qiaoqiang Gan, PhD, associate professor of electrical engineering in the School of Engineering and Applied Sciences at UB, and the study's lead author. Co-authors of the study -- which will be featured on the cover of September's Advanced Science News -- in Gan's lab include Dengxin Ji, Alec Cheney, Nan Zhang Haomin Song and Xie Zeng, PhD. Additional co-authors come from Fudan University and Northeastern University, both in China, and the University of Wisconsin-Madison. The sensor works with light in the mid-infrared band of the electromagnetic spectrum. This part of the spectrum is used for most remote controls, night-vision and other applications. The sensor consists of two layers of metal with an insulator sandwiched in between. Using a fabrication technique called atomic layer deposition, researchers created a device with gaps less than five nanometers (a human hair is roughly 75,000 nanometers in diameter) between two metal layers. Importantly, these gaps enable the sensor to absorb up to 81 percent of infrared light, a significant improvement from the 3 percent that similar devices absorb. 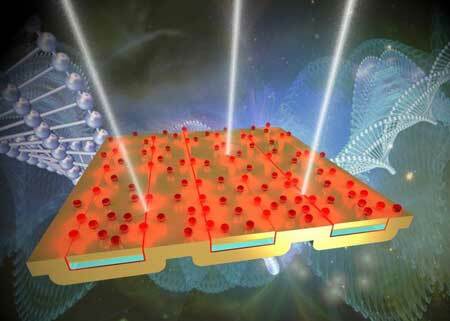 The process is known as surface-enhanced infrared absorption (SEIRA) spectroscopy. The sensor, which acts as a substrate for the materials being examined, boosts the sensitivity of SEIRA devices to detect molecules at 100 to 1,000 times greater resolution than previously reported results. The increase makes SEIRA spectroscopy comparable to another type of spectroscopic analysis, surface-enhanced Rama spectroscopy (SERS), which measures light scattering as opposed to absorption. The SEIRA advancement could be useful in any scenario that calls for finding traces of molecules, says Ji, the first author and a PhD candidate in Gan's lab. This includes but is not limited to drug detection in blood, bomb-making materials, fraudulent art and tracking diseases. Researchers plan to continue the research, and examine how to combine the SEIRA advancement with cutting-edge SERS.